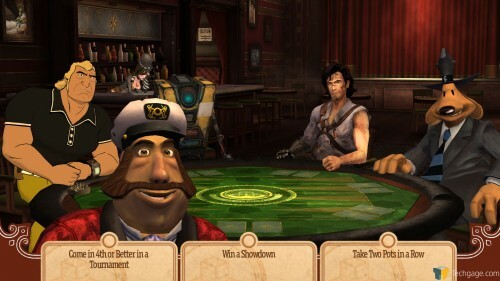 A single-player poker game might not sound too exciting at first, but Telltale Games has done a fine job of spicing things up. It’s tossed in a collection of recognizable characters, a slew of one-liners and the ability to unlock exclusive items in Borderlands 2 and Team Fortress 2. The icing on the cake? The game’s $5 price tag. For a developer that’s best-known for creating episodic games, a stand-alone poker game might seem a bit unusual. But when it’s Telltale Games we’re talking about, it makes all the sense in the world. After all, the company’s first game was Telltale Texas Hold’em – clearly, the founders enjoy a good game of cards. 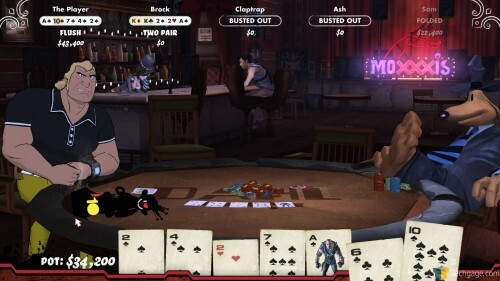 In 2010, the company released its second poker game, called Poker Night at the Inventory, and apparently it was successful enough to warrant a sequel. Welcome to Poker Night 2. Poker Night 2 follows closely in the footsteps of the original, so if you happened to enjoy that one, there’s no doubt that you’ll enjoy this one, too. Unlike the original, which featured four characters that all had their own respective videogames, Poker Night 2 changes things up a little. Claptrap will be instantly recognizable to any Borderlands fan, and even if you’ve never played the games, it’s pretty hard to not recognize Sam from the Sam & Max series. The two characters that might not be obvious are Ash and Brock – Ash (Williams) comes from The Evil Dead franchise, while Brock (Samson) comes from The Venture Bros. television series. This is an odd mix of characters, but that doesn’t matter – they all work pretty well with each other. 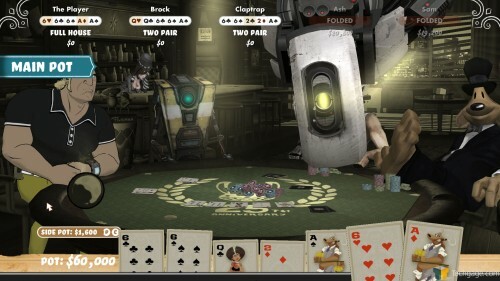 The dealer in Poker Night 2 is none other than Portal 2‘s devious overlord GLaDOS. Yes – you can expect much jeering on her part, and even on the part of the rest of the AI players. You’ll be mocked for folding, for going all-in and for taking too long to make your next move – not too dissimilar from a real-life match. Like the original, the tournament is held at “The Inventory”, a secret underground club that in this game, introduces a bar. And who else but the foxy Mad Moxxi to do the bartending? Other cameos include Steve from Borderlands 2, Captain Reginald Van Winslow from Tales of Monkey Island and Doug from The Walking Dead. Also returning here are unlocks – items you can win from a tournament that unlock special items in other games. 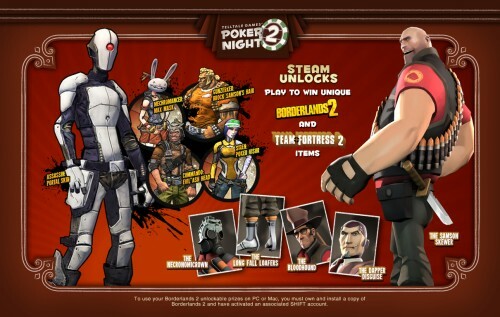 On all three platforms Poker Night 2 is on, half of the unlocks are for Borderlands 2. The others are Team Fortress 2 (PC), dashboard themes (PS3) and avatar items (Xbox 360). I think the PC got the better end of this deal. To gain the ability to procure the special item from one of the players, you must first accomplish a couple of bounty goals. The shot above gives an example of this. Here, I had to place 4th or higher in a tournament, win a showdown and win twice in a row. Pretty easy stuff, although some get a bit more complicated (or even easier, such as merely ordering a drink). As you progress through your tournaments, you’ll earn tokens which can be used to unlock new tables, cards and chips; one for each of the player’s franchises along with Portal. On the PC, and likely also the consoles, achievements can be unlocked for playing at a table that’s decked out head-to-toe with the same franchise’s gear. 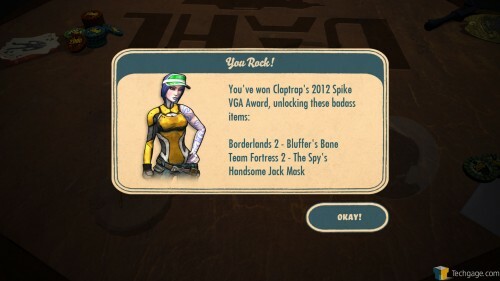 Borderlands 2 is the cheapest theme to unlock, while Portal 2 is the most expensive (requiring about 10 tournament wins to unlock). Even if you don’t win a tournament, you are still awarded tokens based on your place – first nets you 100, second gives you 50, and so on. After you complete a particular bounty and a player offers up their special item, winning the tournament will greet a screen like the one below, explaining exactly what you’ve won. From here, you can go into the Bounties area in the main menu and download the reward in order to access it in Borderlands 2. Team Fortress 2 rewards run right through Steam, so whenever you win a new bounty item, your items should become available in that game immediately. Gameplay-wise, Poker Night 2 behaves just like you’d expect a poker game to. Two flavors are offered here – Texas and Omaha Hold’em – the latter of which differs mainly be allowing the player to hold 4 cards in their hand instead of two, although only 2 of these cards can be used in the final hand. The AI seems reasonable for the most part. Like real poker, you’ll have to decide for yourself if someone is bluffing or not, and if the player goes all in, it’s probably not a bluff, especially if there are five cards on the table. The oddest move I exhibited was Claptrap calling for $2,000 when all five cards were on the table and no one was knocked out yet – he had a mere pair of 2s. That’s not likely a bet that any sane person would make in a real poker tournament in that type of situation. I’ve also seen it a number of times where a player will fold before the flop when the stakes were low and their pockets filled. Slight oddities aside, what’s here is good, and if you want more realistic poker, you’ll have to play it in real-life, or online against real people. As you’d expect with a game that thrives on character dialog, you’re going to be hearing the same lines over and over. In a match I played during the course of writing this review, I heard two sets of dialog twice over in the span of a half an hour. In my experience so far, that’s a rarity, but it really shouldn’t have a chance to happen as far as I’m concerned. If you’re in the midst of a large block of conversation, you’ll be unable to make a move until it completes. Having the option to skip ahead would be useful. Speaking of skipping ahead, if you find yourself with a useless hand, you have the option to skip to the end of the round – extremely useful especially if you fold before laying chips down. Based on what I’ve said in the review so far, it’s probably obvious that this game is worth picking up – and it is. For five dollars, you just can’t beat it. It’s fun to listen to all of what the characters have to say, and there have been times when I’ve genuinely laughed out loud. The characters are good, and so are the environments. And if you happen to enjoy unlocking things, there’s quite a bit of that to do here. If you enjoy poker and enjoy the franchises of the characters that are featured, or just want to enjoy a humorous laid-back game for once, definitely pick this up. To me, the game is loaded with pros and has few cons. One con, however, is rather major, and I hope Telltale remedies it in the future. I’m talking the lack of multiplayer. Prior to Poker Night 2‘s release, I had planned to pick the game up and play with a friend. After all, poker is meant for more than one person, so I just assumed the game would support that. Not so, and for $5, I guess I can’t complain. But for that ability, I’d be willing to shell out twice as much, because quite frankly, poker is much more fun against real people than it is AI.